2014 Sage Autographed Football doesn't mess around. It's all autographs and lots of them -- at least on a pack and box level. Produced in limited numbers, the product features more than 50 players primed to be picked in the 2014 draft. 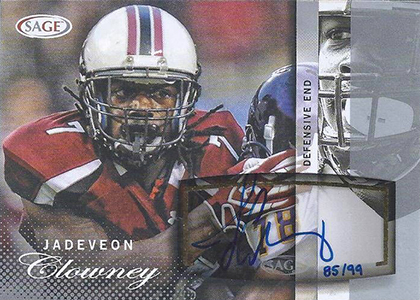 Every pack of 2014 Sage Autographed Football comes with just two cards but both are autographed. With 12 packs in a box, that works out to 24 autographs. Base autographs aren't serial numbered but four parallels are: Silver (#/99), Gold (#/50), Platinum (#/25) and Master Edition (1/1). The checklist has a total of 54 different players. 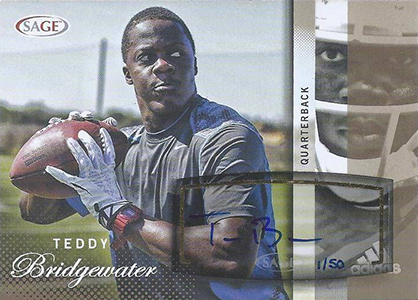 Highlights include Teddy Bridgewater, Blake Bortles, Jadeveon Clowney and Marqise Lee. Autograph inserts include Aspire (#/10) and Sophomore Stars. 2014 Sage Autographed Football doesn't have any redemptions, at least not in the traditional sense where cards aren't ready. However, there is a chance to get an autographed Johnny Manziel photo.